Target –Leadership in a Student-Centered Learning Environment. FWSU will foster development of teacher & student leaders who provide innovative opportunities for local and global student-centered learning. Action Steps – (1) Ensure students and staff take an active role shaping their learning using rich, authentic questions, problems they identify, and diverse resources (2) Provide multiple avenues for students and staff to lead, advocate, and serve within the school and community (3) Develop learning habits, communication and problem-solving skills necessary for collaborative learning and leadership. Indicators of Success – (1) Teachers embrace the role of coach, facilitator and co-learner in a student-centered learning environment (2) Creativity and risk-taking will be evident and celebrated as learners embrace new technologies (3) Student voice will have the power to impact the perceptions of others. Positive Behavior Interventions and Supports, commonly known as PBIS, is a nationally-recognized approach to supporting the social/emotional and academic successes of all students. Based on a three-tiered model, PBIS schools design a continuum of proactive and reactive supports and interventions for students that promotes a positive school climate and increased access to learning. During tier one implementation, also called the universal level, preventative and proactive school-wide and/or classroom systems for all students and staff are designed and enacted. The universal level includes setting three to five behavioral expectations for the entire school. At Fletcher, these include being respectful, responsible, safe and caring. The universal level also includes procedures for teaching the school-wide expectations, methods for acknowledging positive behavior and discouraging problem behavior, and strategies for keeping track of behavioral data and making data-driven decisions. Last, spring, under the umbrella of the school-wide expectations, the Fletcher staff created specific behavior guidelines for various student locations including the bus, halls, cafeteria and field trips. Capitalizing on the school’s mascot – the Falcon – Fletcher teachers, lead by PBIS Coordinator and School Counselor Sandi Simmons, decided to use paper feathers with students as recognition when they meet behavioral expectations. When a staff member sees or hears a students following the school-wide expectations, they are given a feather. Those feathers are accompanied by a specific verbal acknowledgement of the behavior that the staff member wants to reinforce. Feathers are accumulated to earn classroom and school-wide celebrations. 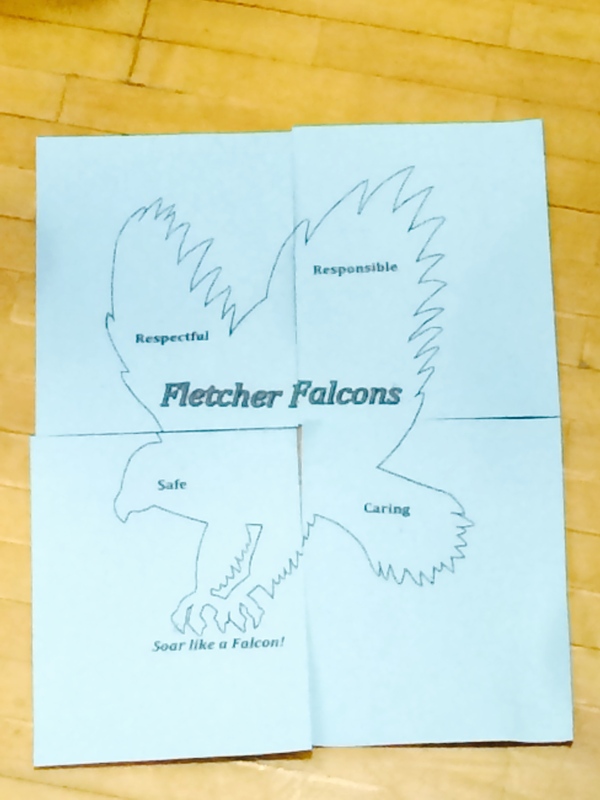 Fletcher’s PBIS system centers around the falcon mascot. 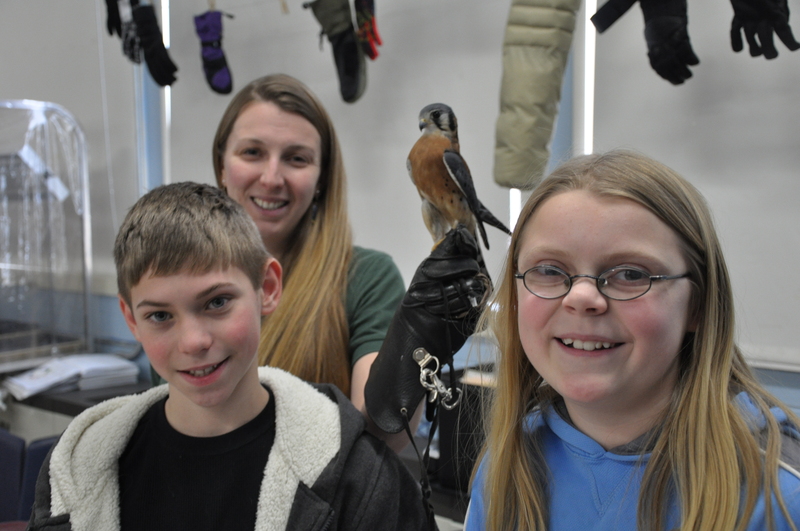 The Vermont Institute of Natural Science recently brought a live falcon (and other birds) to Fletcher as part of a mid-year review of school-wide expectations. When necessary, the universal implementation of PBIS also includes a response to inappropriate behavior. In Fletcher, students are typically reminded and redirected when they begin to experience behavioral challenges. They may then be asked to take a break in a specific location in the classroom. These breaks are brief and part of the everyday routine. They are taught and practiced in a way that avoids humiliation, and serve as an opportunity for students to regain their composure and rejoin the group. If students need more time, they may be asked to take a longer break in a Buddy Classroom. During this time they complete a written reflection on their behavior (with support, if needed) and create a plan to successfully rejoin their class. In some cases, if behavior is unsafe or repetitive, students may be asked to process in the office. In any of these scenarios, the emphasis in on the behavior, not the child. Students are supported in thinking about how their behavior fits into the school’s expectations and how their actions impact others and their own learning. The process is intended to be positive and supportive, rather than punitive and shameful. 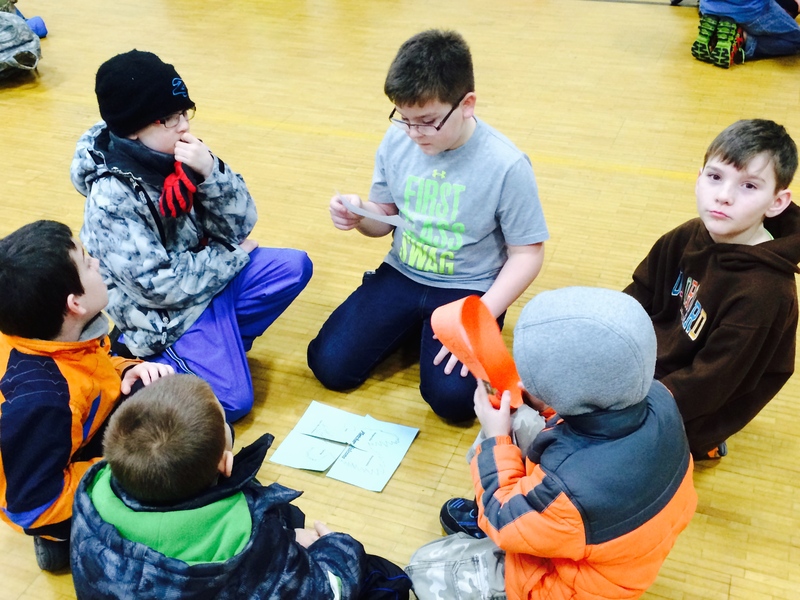 Students work in multi-age groups to assemble a falcon puzzle that helps them review school-wide expectations as part of a whole-school assembly in early January. The third tier of PBIS includes intensive supports that are specialized and individualized for students at high-risk. This tier might include specialized evaluations, individual adult support, specialized teaching and behavior planning. In early January, Fletcher’s universal implementation of PBIS was assessed, receiving a commendable 98 percent score. In her comments, evaluator Kym Asam complimented students and staff for knowing and understanding the school-wide expectations as well as the recognition system being used. The falcon puzzle mentioned above. “I interviewed over 10 staff,” Asam wrote, “And all could not only tell me what the school-wide expectations are but explained how they are implementing them, acknowledging positive student behaviors and noticing the significant positive change in culture for staff and students…The climate of the school was positive and invested in supporting students in being successful. Staff reported being excited about the PBIS framework in that it allows for consistent communication, expectations, and responses to the social and emotional functioning. Thus far, Fletcher has focused on the universal implementation level, but is gearing up for tier two training in March. Visit the Vermont PBIS website here. 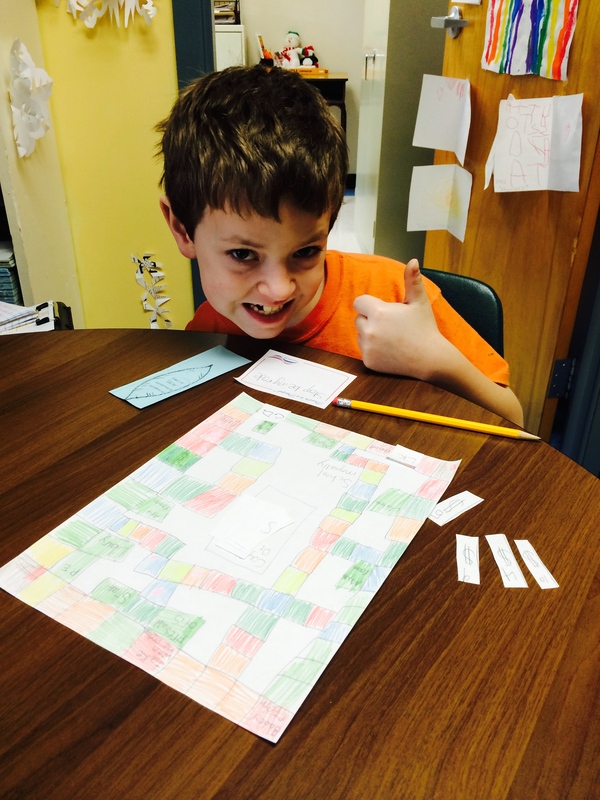 This entry was posted in FES and tagged PBIS, Student-Leadership by Franklin West SU. Bookmark the permalink. cool on the game! there is a make your own opoly game that kids could use to make something like this “professional”….